» Get faster in the finder – reveal the script menu you down with FCP? Applescript is a powerful thing. It can do incredible things for those who know how to code, but it can be a bit daunting for those who don’t. There is one great way to be able to use some sample scripts without writing any code and it is built into the os by default! 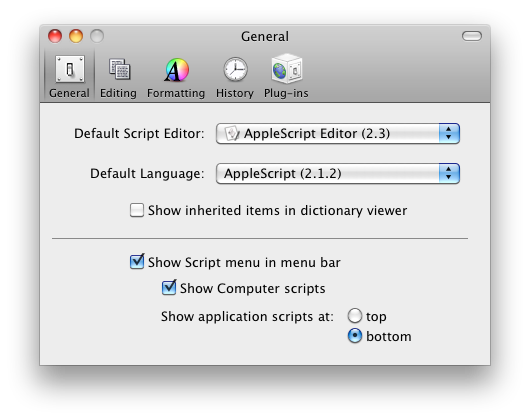 If you go into applications>utilities you will find “Applescript Editor” Open it up and go into preferences. Click on the “show script menu in menu bar” radio button and quit the app. Now you should have a little icon in you upper right menu bar that looks like a piece of parchment. That is a shortcut to open a bunch of applescripts. The os has a few installed by default. The most important ones (to me) are in the finder scripts folder. There you can add suffixes or prefixes to filenames, you can find and replace text, change case, or trim from the start or ending. This set of tools really helps when you need to batch change a bunch of .movs to .mp4, or when you want to add a job number or date to a bunch of deliverables. There are definitely other standalone apps for renaming files out there. A better finder rename, name mangler, and automator all come to mind, but they aren’t as easy to use, or they don’t come pre-installed. Give it a shot,, you might not need it every day, but no one wants to have to manually do anything that can be automated. It should also be noted that if you do write any applescripts, you can put them in the scripts folder and have them appear in the pulldown menu. Have fun automating! UPDATE-I just saw that 10.6 (snow leopard) doesn’t install all of the scripts that previous versions did. Most importantly it doesn’t install the finder scripts. I’ve zipped the 10.5 scripts up and you can download them here. ~ by ross on December 2, 2010. Fastscripts is well worth a look. The ‘Select Regular Expression’ script is helpful sorting out particular file types in a folder.